The 2017 Diamond Resorts Invitational golf tournament on the PGA Champions Tour is taking place this week from January 13-15, 2017, at the Tranquilo Golf Club at Four Seasons located in Orlando, Florida. Here is a list of the sports celebrities playing in the 2017 Diamond Resorts Invitational. A select field of 30 PGA Senior players will be competing this week at the 2017 Diamond Resorts Invitational which is a new tournament on the PGA Champions Tour. The best known senior players competing this week are John Daly, Colin Montgomerie, Lee Janzen, Mark Calcavecchia and Ian Woosnam. The senior players are competing for $750,000 in prize money. The sports celebrities are competing for prize money of $500,000. The winning sports celebrity will take home a 1st place prize of $100,000. Former pro tennis player Mardy Fish won this tournament last year and he's back to defend his title as the only tennis star in the field. Women golfers in the field include LPGA stars Brooke Henderson, Lexi Thompson, Brittany Lincicome and Brittany Lang along with Golf Channel's Blair O'Neal. It's unclear if the LPGA women golfers can earn prize money here but it looks like they can from the $500,000 pool for the celebrities. Current and former NFL players include Marcus Allen, Larry Fitzgerald, Richard Dent, Danny Kanell, Ryan Longwell, Mark Rypien, Bryan Walters, Brian Urlacher, Sterling Sharpe and Patrick Peterson. NHL players include Mike Modano and Jeremy Roenick, while Ray Allen is the lone NBA celebrity. From NASCAR both Michael Waltrip and Denny Hamlin are playing. Non-sports celebrities playing include singer Colt Ford, Larry the Cable Guy, singer Jake Owen, Rob Riggle, Alfonso Ribeiro, Cole Swindell and Jack Wagner. The biggest contingent of sports celebrities is from baseball. Reggie Jackson, Roger Clemens, Josh Beckett, Johnny Damon, Mark DeRosa, Josh Donaldson, Terry Francona, Eric Gagne, John Smoltz, Tom Glavine, Troy Glaus, John Hart, John Lackey, Jon Lester, Derek Lowe, Greg Maddux, Brian McCann, Kevin Millar, Mark Mulder, Phil Nevin, Bud Norris, Dan Plesac, Bret Saberhagen, Justin Verlander, Gaylord Perry and Tim Wakefield are all playing. 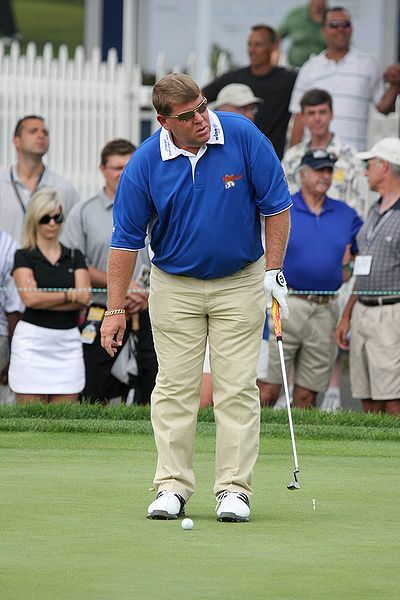 Good luck to all the celebrity sports golfers this week. You can watch them and the Senior PGA Tour players at the Diamond Resorts Invitational on the Golf Channel this weekend.